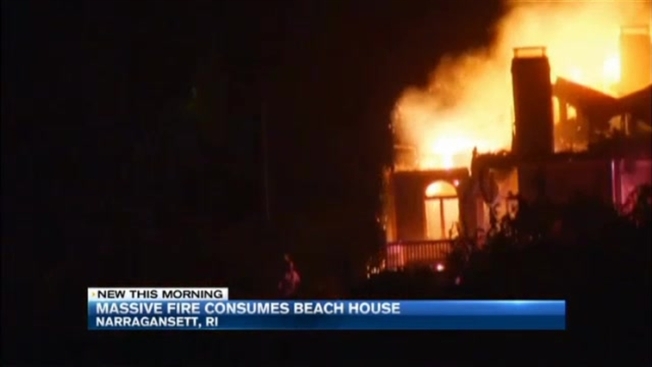 Fire investigators say the cause of a blaze that gutted a multi-million dollar 1880 oceanfront house in Narragansett, Rhode Island, may never be determined. Fire Chief Scott Partington says the $3.1 million home owned by the family of late Pawtucket Red Sox co-owner James Skeffington is considered a total loss following Monday night's fire. Strong winds from Hermine coupled with "water problems" at the scene prompted fire crews to attack the flames from the outside. Winds were estimated to have reached 30 to 50 mph gusts. Partington says the fire already engulfed the two-story home's upper levels by the time firefighters arrived to the estate. No other structures on the property were damaged. A South Kingstown firefighter was treated for smoke inhalation. A Narragansett firefighter suffered a knee injury fighting the blaze.